Alone in the room with your patient, you think you have control over what happens? You think that it's you and the patient setting the terms and content of what tests and treatments are offered, negotiated, and agreed to? 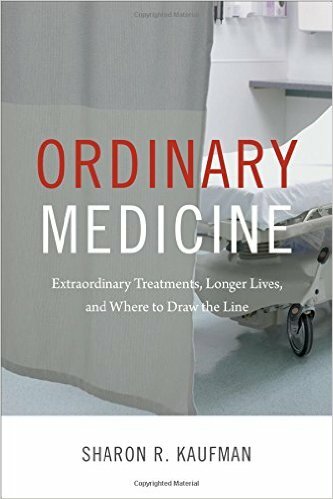 In a brilliant new book, Ordinary Medicine: Extraordinary Treatments, Longer Lives, and Where to Draw the Line, the medical anthropologist Sharon Kaufman illuminates the role of larger forces in shaping what is discussed in clinic examination rooms, at bedsides, and in consultation. 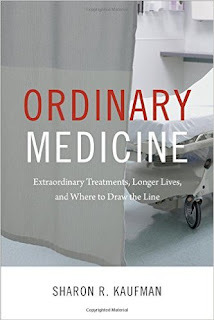 We had the pleasure of hosting Sharon Kauffman for our fist ever UCSF Division of Geriatrics Book Club yesterday. Her book took me back to my freshman Introductory Sociology Class at Michigan. I remember hearing about the "invisible hand" of larger social forces that, without our intention, guide our actions. The rise of the Medical Industrial Complex. In 1980, pharmaceutical and device funding accounted for 32% of medical research funding, now it's 65%. That's a huge shift. As we in medicine all pretty much bow down at the alter of Evidence Based Medicine, the evidence we rely on is increasingly set by industry, big pharma, and device manufacturers. This has played out, for example, in ever expanding criteria for Implantable Cardiac Defibrillators (ICDs). ICD's are now being put into people in their 80s and 90s, into people who have never had a symptomatic arrhythmia, because doctors feel that if the evidence is there, they have to offer it. Once Medicare approves it, it immediately becomes standard of care. Doctors now feel that they have an obligation to address Medicare approved treatments. These forces are not just influencing doctors, who feel compelled to offer and discuss Medicare approved tests treatments they would not recommend, as Sharon Kaufman notes in her book. As we discussed in our book group, patients now search the internet and request these tests and treatments. I have an oncology friend who says, "My patients all want a the latest scan or genetic test. In most cases, it won't change my management. I tell them that. They say, "Will my insurance pay for it? Then I want it." Kaufman describes this as the "more is better" approach in medicine. My oncologist friend describes it as a patient approach to value-based health care: "I want all the tests and treatments my insurance will pay for." So you think you have control over what you talk about with a patient? Think again. You're not alone with your patient in that exam room - there's an invisible hand reaching in and guiding your conversation. The hard part about these larger social forces is that it's very hard to recognize them in your every day practice. It takes an outsider looking at the system with an anthropologists eyes to recognize what a strange system we work in, that the rules are rigged, and that health, well-being, and improved quality of life are hardly the goals and outcomes our health care system is designed to promote. I smile as I read your blog today Alex with your comment about the Medical Industrial Complex. In the 1960's nurses were saying the same thing about the Medical-Management Complex (Big Pharm was not a player at the time). Sure enough, management and medicine decimated the ranks of nurses in acute care facilities - too expensive and dispensable. Now it is your turn to face the music. As a result, many nurses have found new and vital roles to play in the wellness and sickness care of our population. Maybe medicine can figure a way to do the same. Excellent piece, Alex. Thank You. The vignettes illustrate a different "invisible hand" which unfortunately is most often not in play today: the sense of community or shared burden and shared responsibility. In this context it means accepting that our decisions as patients and providers (physicians, nurses, administrators, pharma execs) have an impact on the larger community of all patients and providers and accepting that we should consider that impact when making micro and macro healthcare decisions. Asking for an expensive test only because the insurer will pay is one of thousands of decisions made every day which reflect the lack of a sense of shared responsibility. Pricing oncologic therapies to the maximum that a rigged market will bear exemplifies the industry side of this as well. I recall a case discussion 31 years ago during residency training where I suggested that a sense of community responsibility should play a role in a clinical decision and was hastily dismissed as a heretic by both a senior physician and a bioethicist. I was told that the ONLY thing that mattered was the patient in front of me and not other "hypothetical" patients. Perhaps one could substitute stockholders for patients to gain a sense of the industry's moral imperative. Little has truly changed in this regard for the practice of medicine or the business of medicine. Clearly I do not want anything to be more important to me in practice than the patient in front of me. Nonetheless I hope we can find a means to promote a measure community benefit in our shared decision making model without those considerations being exclusively externally applied and perceived as restrictions. When the invisible hand is our own perhaps it will be more gentle and reasonable. Paul Starr wrote "The Social Transformation of American Medicine" around 1984 when I was getting into geriatrics. It covers and anticipates some of the changes that Sharon Kaufman addresses in her contemporary look at the same issues. A painful reminder of the tensions, then and now, is the Battle for Boston, AKA Partners Health Care and surgeons doing two surgeries at once. Many good analyses will come out of this embarrassment and become case studies at the Harvard Business School for how not to manage a problem. General Electric, General Motors and General Practitioners all operate on the same principles.